I can provide support with undertaking a range of investigations whether in relation to disciplinary or grievance cases, or allegations related to bullying or harassment. In addition I can provide training support and standard tools to support those organisations who wish to move to undertaking their own investigations. 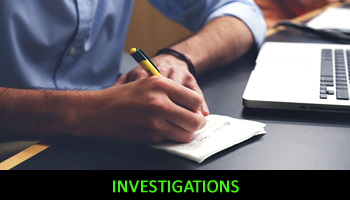 To discuss any issues around how to approach an investigation or indeed to arrange to have appropriate investigations undertaken on behalf of your business, please give me a call on 07850 208701 or email me on rcwhrsolutions@talktalk.net noting your contact telephone number and I will come back to you as soon as I possibly can.